Coffee “pure” Arabica is there such a thing? Coffee originally comes from a single varietal of Arabica found in the Limu forests of Ethiopia. From there is spread first to the Yemen, where then partially roasted seed became part of the silk trade, and eventually thanks to an Indian Monk Baba Budan ends up in Mysore Indian as a seed, and the Dutch then take it back to Holland, and so began the cross pollination and botanical fiddling, that today gives us over 140 varieties of Arabica. 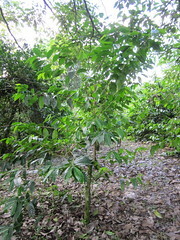 The original varietal is now call typica and is found in Ethiopia, and parts of what remains of the Yemen plantation, planted between 500 and 600 AD.